This pathetic Islamic thug was caught trying to sneak on a ship with women and children to get back to Great Britain! But his bid to sneak on one of our ships was blocked at harbour gates by sharp-eyed officials. Syrian Bakri can’t return there because he faces 20 years’ jail over a coup bid. Over 20 years in the UK, Bakri sponged £300,000 in benefits. 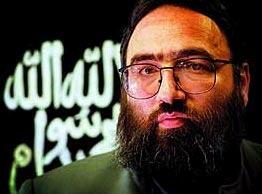 He preached violence and praised the 9/11 al-Qaeda terrorists as the Magnificent 19. Bakri, dubbed the Tottenham Ayatollah, was a member of al-Muhajiroun, which he left to form al-Ghuraba. HotAir has more on the Islamothug.